We all know that in every competitive exam, at least 2-3 questions are asked from the Indian Economy. But most of them fail to answer those questions and lose their marks due to lack of knowledge. 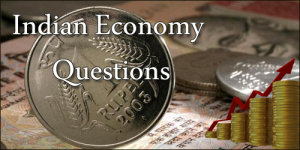 Hence, to help all those aspirants in scoring good marks and improving their knowledge of Indian Economy, we have provided some top 50 GK Questions on Indian Economy which are frequently asked in the competitive exams. Therefore, the candidates who are going to appear for UPSC/ SSC/ Bank/ Other Exams must go through this complete article and must gain some knowledge about our Indian Economy. Therefore, the top 50 GK Questions on Indian Economy have been provided here. If you want GK Questions on various topics of General Awareness, go to our GK Page.